I want to post the below message from the 'Blue Book.' This is because we have been seeing an increase in the spread of error – the 1st sign. And it seems that the 2nd sign is looming (e.g., see https://news.un.org/en/story/2019/04/1035941). Of particular concern is the current tension between Russia and NATO. Ukraine may be the first bridghead, Europe next (https://www.kyivpost.com/ukraine-politics/russia-preparing-for-full-scale-war-in-europe-ukraine-will-be-first-bridgehead.html). The concern over an outbreak of war between Russia and NATO arises because Our Lady has warned us about the rise of communism many times in Fatima. Also, Conchita of Garabandal speaks of the spread of communism (e.g., https://www.apostoladodegarabandal.com/en/a-grande-tribulacao-antes-do-aviso2/) prior to the miracle (hence prior to the warning). Conchita told the author in 1965 when everything would be set in motion: "When communism comes again everything will happen. Dear brothers and sisters, it is time to pray. It will not come upon us all at once (see Mark 13:7; Matthew 24:6). All the same, let us heed our Archbishop's recent Lenten message: "We are facing a crisis of faith. The only way through this crisis is a return to fidelity, a return to the Gospel, a return to Christ." I have announced to you many times that the end of the times and the coming of Jesus in glory is very near. Now, I want to help you understand the signs described in the Holy Scriptures, which indicate that his glorious return is now close. These signs are clearly indicated in the Gospels, in the letters of Saint Peter and Saint Paul, and they are becoming a reality during these years. - The first sign is the spread of errors, which lead to the loss of faith and to apostasy. These errors are being propagated by false teachers, by renowned theologians who are no longer teaching the truths of the Gospel, but pernicious heresies based on errors and on human reasonings. It is because of the teaching of these errors that the true faith is being lost and that the great apostasy is spreading everywhere. -The second sign is the outbreak of wars and fratricidal struggles, which lead to the prevalence of violence and hatred and a general slackening off of charity, while natural catastrophes, such as epidemics, famines, floods and earthquakes, become more and more frequent. 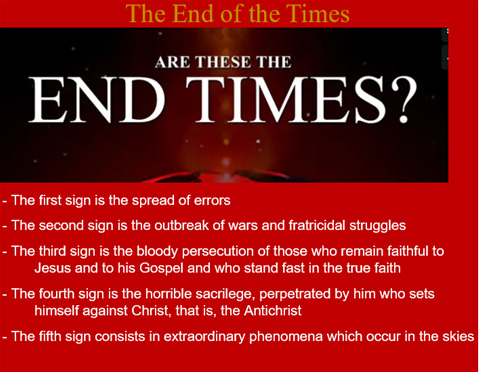 - The third sign is the bloody persecution of those who remain faithful to Jesus and to his Gospel and who stand fast in the true faith. Throughout this all, the Gospel will be preached in every part of the world. Think, beloved children, of the great persecutions to which the Church is being subjected; think of the apostolic zeal of the recent popes, above all of my Pope, John Paul II, as he brings to all the nations of the earth the announcement of the Gospel. - The fourth sign is the horrible sacrilege, perpetrated by him who sets himself against Christ, that is, the Antichrist. He will enter into the holy temple of God and will sit on his throne, and have himself adored as God. Beloved children, in order to understand in what this horrible sacrilege consists, read what has been predicted by the prophet Daniel: 'Go, Daniel; these words are to remain secret and sealed until the end time. Many will be cleansed, made white and upright, but the wicked will persist in doing wrong. Not one of the wicked will understand these things, but the wise will comprehend. The Holy Mass is the daily sacrifice, the pure oblation which is offered to the Lord everywhere, from the rising of the sun to its going down. The sacrifice of the Mass renews that which was accomplished by Jesus on Calvary. By accepting the protestant doctrine, people will hold that the Mass is not a sacrifice but only a sacred meal, that is to say, a remembrance of that which Jesus did at his last supper. And thus, the celebration of Holy Mass will be suppressed. In this abolition of the daily sacrifice consists the horrible sacrilege accomplished by the Antichrist, which will last about three and a half years, namely, one thousand two hundred and ninety days. - The fifth sign consists in extraordinary phenomena, which occur in the skies. 'The sun will be darkened and the moon will not give its light; and the stars will fall from the sky; and the powers of the heavens will be shaken.' (Mt 24, 29) The miracle of the sun, which took place at Fatima during my last apparition, is intended to point out to you that you are now entering into the times when these events will take place, events which will prepare for the return of Jesus in glory. My beloved ones and children consecrated to my Immaculate Heart, I have wanted to teach you about these signs, which Jesus has pointed out to you in his Gospel, in order to prepare you for the end of the times, because these are about to take place in your days. The year which is coming to a close, and that which is beginning, form part of the great tribulation, during which the apostasy is spreading, the wars are multiplying, natural catastrophes are occurring in many places, persecutions are intensifying, the announcement of the Gospel is being brought to all nations, extraordinary phenomena are occurring in the sky, and the moment of the full manifestation of the Antichrist is drawing ever nearer. And so I urge you to remain strong in the faith, secure in trust and ardent in charity. Allow yourselves to be led by me and gather together, each and all, in the sure refuge of my Immaculate Heart, which I have prepared for you especially during these last times. Read, with me, the signs of your time, and live in peace of heart and in confidence. 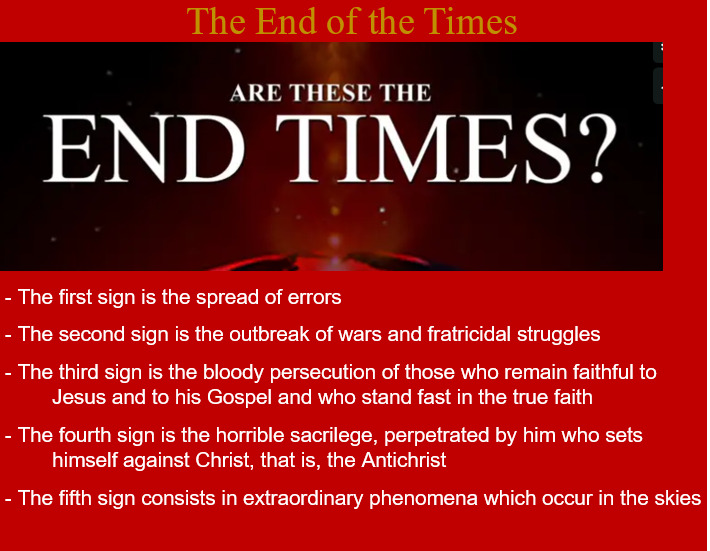 I am always with you, to tell you that the coming about of these signs indicates to you with certainty that the end of the times, with the return of Jesus in glory, is close at hand. 'Learn a lesson from the fig tree: when its branches become tender and sprout the first leaves, you know that summer is near. In the same way, when you see these things taking place, know that your liberation is near.' (Mt 24, 32-33)"